La Mesa Mexican Restaurant serves authentic Mexican food in a casual, family-friendly environment. With delicious Mexican dishes, an extensive selection of premium tequilas, excellent happy hour specials, and eight locations across Nebraska, Iowa, Kansas, and Missouri, it’s no wonder why La Mesa is the go-to Mexican restaurant for so many Midwest residents! La Mesa’s menu has something for everyone—tacos and fajitas, build-your-own combinations, seafood dishes inspired by the Gulf of Mexico, appetizers, soups and salads, desserts, and more! La Mesa offers daily menu specials Monday through Friday at all of our locations. We also have happy hour specials Monday through Thursday from 3 p.m. to 5 p.m. and again from 8 p.m. to close! Looking for a way to spice up your office lunch, corporate event, holiday party, or special event? La Mesa offers catering for groups of 10 and up and can satisfy any craving or budget! La Mesa Mexican Restaurant operates eight locations across Omaha, NE, Council Bluffs, IA, Lansing, KS, and St. Joseph, MO. We believe in quality food, a family-friendly atmosphere, and excellent customer service. 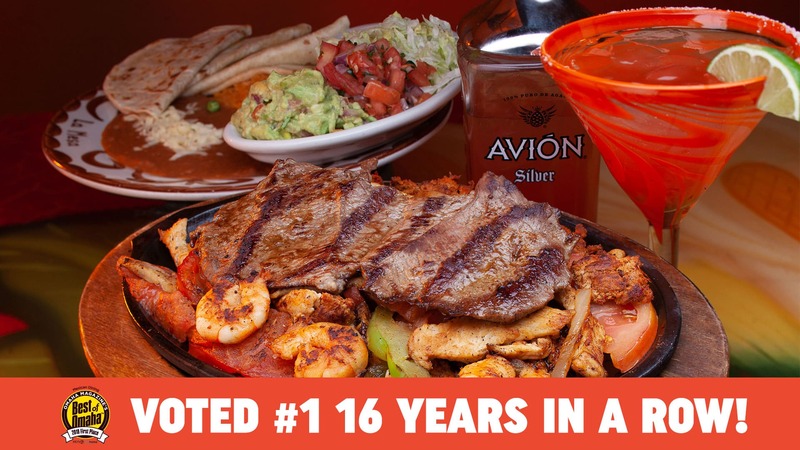 It’s why we’ve been named Best Mexican Restaurant 14 years in a row in the Best of Omaha contest! Learn more about our history and why so many people choose La Mesa over other Mexican restaurants. Questions or concerns? We’re happy to help, and we value the feedback you provide. Submit a message below, and we’ll get back to you as soon as possible.